Many years ago (in ~2000, give or take a year?) I remember seeing some discussions on The Motley Fool UK's forums about how much more diversification investing in an FTSE-AllShare tracker instead of an FTSE-100 tracker was actually buying. Popular wisdom seemed to be that, at that time, the FTSE100 companies total market cap comprised 80% of the FTSEAllShare total market cap, so an FTAS tracker perhaps doesn't get you as much diversification away from the FTSE100's companies as you'd like to think. You can find several instances of this 80% figure being claimed on TMF UK (including in posts from 1999-2001) by searching things like 80% "All Share" site:http://fool.co.uk on google search. Now there's no particular reason that 80% number should be particularly stable over time... if UK mid/small caps have a boom and the FTSE100 "dinosaurs" go nowhere for a while, it seems the proportion of the rising FTAS market cap comprised by a stable FTSE100's market cap should decline. And since that's exactly what seems to have been going on in the UK in the last few years, I got interested again in how true that "80%" number still was. My Google-fu failed me finding any sort of ready-made answer (although I did keep stumbling over that same 80% figure being mentioned; for example in this thread from 2011). Searching for data to compute it from did find me a very interesting article here from mid-2015 which contains some total market cap data: FTAS £2.14 trillion, FTSE100 £1.71 trillion. And 1.71/2.14 = 0.799 (to three significant figures). Amazing... bang-on the 80% figure again, even after all these years! My question is: what's been going on in the intervening years? How much does this 80% actually vary by in practice? What have been the minimum and maximum values it's reached in the last decade or two? (A link to historic data for FTSE100 and FTAS total market cap values - something I've been unable to find myself - would allow this to be easily answered of course). Just to help illustrate my puzzlement: the plot below shows 15 years of stellar FTSE250 outperformance (note that market cap contribution of the mid-caps dwarfs the small caps by about 5:1; see the EBI article linked above) so by now you'd think the mid-caps would be making up more than 20% of the FTAS cap, if that 80% figure for the FTAS100 was true back in 2000. (This section is actually based on a false premise... skip past the plots and code to the next "Update" for more information). 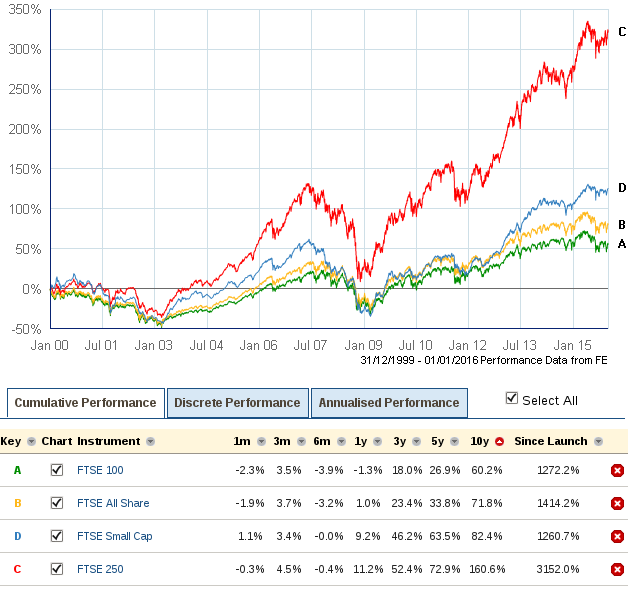 Using the total capitalization values quoted in the article here, and historic index values from here, and using the fact the indices are supposed to be proportionate to their capitalization, it's possible to compute what the proportion of the FTSE-100 cap in the AllShare is on other dates. That gives me the plots below. It strongly suggests the 80% figure being quoted in the past was somewhat optimistic about how much of the FTSE-AllShare is not accounted for by the FTSE-100. However, the 80% figure seems pervasive enough that it must have some factual basis, surely? My bamboozlement continues (which is why I'm updating the question with this stuff rather than offering it as an answer): either I'm misunderstanding something, or a lot of folks (including me) thought their AllShare trackers were getting them more mid-cap exposure than they actually have been... until recently! 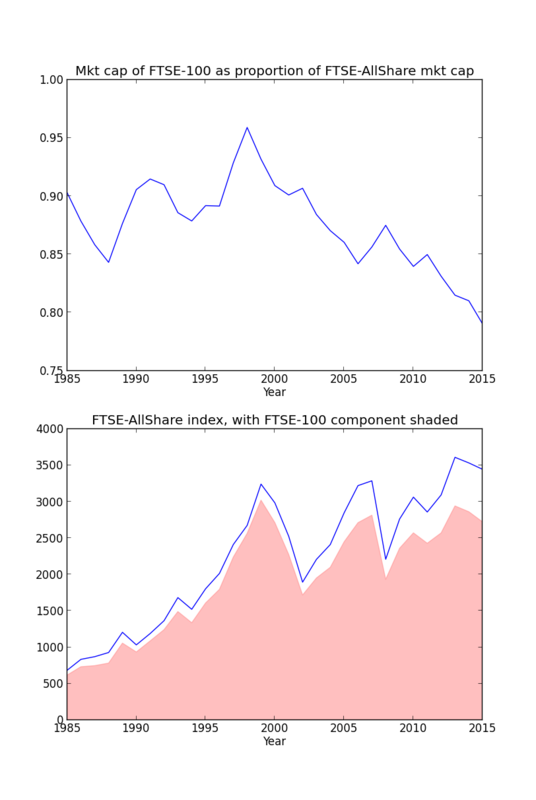 # FTSE-100 and FTSE-AllShare end-of-year index values. Update: I raised this query on TMF UK's Index Tracker forum, which provided a crucial insight: it's possible for the total market cap to vary without the index value changing, either due to company share issues/buy-backs, or companies entering/leaving the index (much more detail in FTSE index calculation guide ). This invalidates all the stuff above which assumes the total cap is always proportional to the index value. However, that still leaves me wanting to know how much this 80% figure fluctuates by in practice! Market Capitalisation-based indices tend to be dominated by the largest market-cap elements. Some could argue that the S&P 500 and NASDAQ-100 are really 'Apple' indices, as Apple Inc. is the largest market cap company in the index, so the index is heavily weighted towards Apple. How much [does] this 80% figure fluctuate by in practice? The 80% figure will fluctuate day by day as market cap is based on the bid-ask price and the number of shares in the free float. You can calculate this based on historical data, though it would be quite time consuming as you have to cover not only the FTSE-100 shares, but all the additional shares in the all-share index. Furthermore, if one of the companies in the FTSE-100 buys a company in the All-shares index, the 80% number will increase. Similarly if one of the companies in the FTSE 100 spins off a subsidiary which itself becomes an element of the All-shares index, then the 80% figure will decrease. Not the answer you're looking for? Browse other questions tagged stocks united-kingdom index-fund market-indexes diversification or ask your own question. Long term bond index prices before 2000?